As an educator, participating in a professional development (PD) event that doesn’t have a predetermined topic or theme might seem unconventional. But it’s a learning format that’s on the rise in the education sector and it caught the attention of three graduate students at Laurier, who put the “edcamp” model to the test Nov. 11 at the Waterloo campus. Faculty of Education graduate students Crystal Shadwell, Brittany McGuire and Salima Hafeez learned about the edcamp model while researching alternative models of teacher PD for an assignment. Unlike traditional PD formats, edcamp participants decide when they arrive what topics they would like to discuss. Topic suggestions are written on cue cards and added to a session idea board. An event organizer assesses the ideas and groups them according to theme. Breakout sessions are then formed. Participants in the sessions share the leadership or “expert” role by contributing their professional expertise or personal experience with the topic of interest. Technology in the classroom, diversity, motivating learners and teaching French were some of the topics discussed at the Laurier edcamp. The edcamp model also offers a more relaxed environment for professional learning. If a session isn’t meeting participants’ needs, they can exercise edcamp’s “two feet rule” and move to a different session without any judgement from the mediator or others – a practice not commonly seen in other professional learning formats. Brenda Davis, a veteran high school teacher in Waterloo, was thrilled to find an edcamp at Laurier. A fan of the learning format, she’s travelled north of Toronto to participate in other edcamps. An edcamp coordinated by the Faculty of Education was an attractive and successful learning opportunity for Davis. The shared learning that emerges from an edcamp is beneficial but so is the opportunity for sustained learning, says student co-organizer Hafeez. A final bonus to edcamps: they’re often free of charge. McGuire, an occasional teacher, finds this particularly attractive, as she isn’t funded for PD sessions organized through her school board. More than 50 educators with varying levels of experience attended the Nov. 11 edcamp at Laurier’s Waterloo campus. Davis hopes edcamp at Laurier will be an annual event. She and other edcamp fans are in luck: junior members of the Education Graduate Student Association (EGSA) have committed to making edcamp a legacy event at Laurier. Shadwell, McGuire and Hafeez graduate in May but are thrilled to see the edcamp model continue. 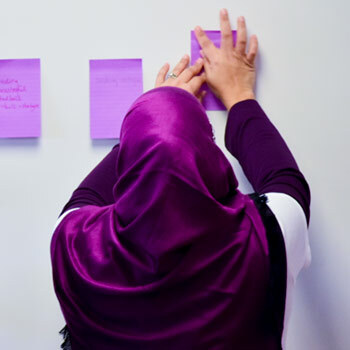 For now, participants at the Laurier edcamp can take the lessons they learned back to their organizations and wait for details about the next un-conference to unfold.